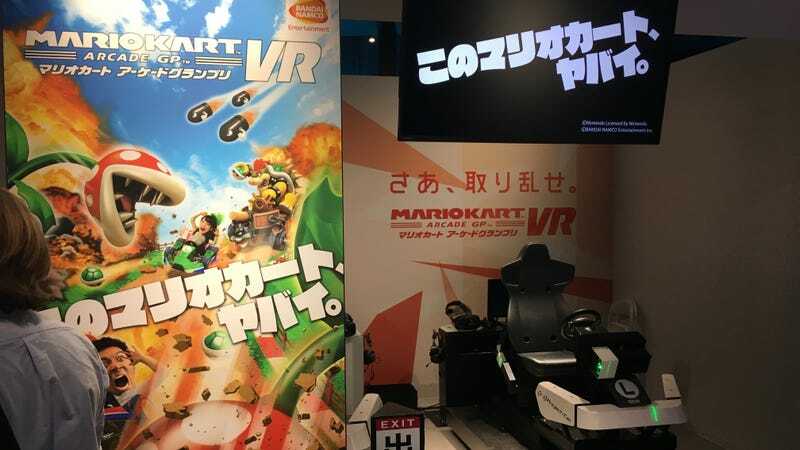 Mario Kart Arcade GP VR isn’t a game that you can buy, but a virtual reality installation in Bandai Namco’s VR Zone attraction in Shinjuku, Tokyo. It promises to put you in the driver’s seat for a Mario Kart race, and that it does. It’s pretty fun, but you’re not really missing out on much if you don’t play it. Bandai Namco held a media event at VR Zone on Tuesday morning in Japan so that members of the press here for this week’s Tokyo Game Show could try out all of the attractions at the venue. Opened earlier this summer, VR Zone occupies a quite large, visually striking building in the Kabukicho district of Shinjuku, which will be familiar to anyone who’s played the Yakuza series. It’s just across from the massive new Toho Cinema, which has a lifesize Godzilla peeking out from its roof. Besides Mario Kart, there were a number of other VR installations, often built around a popular franchise. You could pilot an Evangelion, ride on a Gundam, or perform a Kamehameha with motion controllers in a Dragon Ball experience. Before we were let loose into the VR Zone to try things for ourselves, the designers of the facility implored us to not call anything that we experienced “games.” They weren’t trying to create skill-based games with rules, they said, but experiences. This was certainly the case with Mario Kart. While it sets things up to make it seem like you’re competing against three other racers (the go-kart that you sit in determines if you play as Luigi, Mario, Peach, or Yoshi), the game’s definitely playing some tricks to keep you all together in the race, so that the experience ends at the same time for everyone and you can’t get thrown off course. The course that you drive on is sort of a montage of great Mario Kart moments. One second you’re dodging massive Piranha Plants that are trying to eat you, the next you’re zipping under and around Thwomps that come crashing down, the next you’re trying to avoid running straight into Bob-Ombs that patrol the course. The Vive headset is paired with a sit-down go-kart style motion apparatus that rumbles, moves around on hydraulics, and generally makes you feel like you’re really moving about. The controls are fairly simple: a steering wheel and accelerate and brake pedals. But there’s one twist. Mario Kart items float on balloons above the course, and you can reach out with your hands (which have custom motion trackers put on them), grab the items, then toss them during the race. This is the real “I’m inside Mario Kart!” moment, when you take your hand off the steering wheel, keep steering with your other hand, reach out and grab a Green Shell, lob it at an opponent, cause them to spin out, and zoom past them. Looking back on how cool that moment was, I want to say that Mario Kart VR was worth it for that alone. Although honestly, the experience was so short (and I’ve got to imagine the waits are probably very long when the VR Zone isn’t closed off for the media) that it might be disappointing if you have to make a huge effort to get to try it. It’s a fairly basic VR demo otherwise. Although Mario Kart was what I made a beeline for, I tried some of the other VR attractions as well. These, too, tended to be fairly simple, straightforward, experiential VR demos. The Evangelion one was a pretty repetitive experience where you fired at an Angel that was attacking the city, using a twin-stick control scheme to pilot your Eva. The Gundam demo was a lot more clever, actually. Rather than doing the obvious thing and piloting a Gundam, it took a different tack: You find yourself between two Gundams that are firing on each other, and one of the Gundams puts his hand down for you to sit on. At this point, you walk forward and take a seat on a massive custom chair that has a large cushioned arm on its left side. This is the Gundam’s thumb. You can hold onto this while the two Gundams battle it out right in front of your face. This I felt was a more unexpected way to involve the player in the VR scenario, and a more memorable experience overall. While attractions like VR Zone are likely the way that many people will first experience VR, the nature of an installation like this means that the experiences will be short and sweet, so that as many paying customers as possible can be processed through the lines every day. It would be interesting to see what an actual game of Mario Kart would be like in virtual reality, but that’s probably not something we’re going to see anytime soon.